Firefox4 has made a good beginning since the release for it has been downloaded for up to one million times in the first three hours. If the current Firefox4 download speed keeps going on, it is going to defeat Microsoft IE9 easily. Microsoft has ever issued that in the first 24 hours IE9 was downloaded for as many as 2.4 million times. Nevertheless, Mike Beltzner from Mozilla stated that Firefox4 was not as good as Firefox3.6 in performance. In the first three hours, Firefox4 download is about 5000 to 6000 times per minute which is less than the half of Firefox3.6 download, up to twelve thousand times per minute. Mozilla foundation has set up a Firefox4 download real-time counter on its website. Mozilla foundation developers held a simple celebration when the Firefox4 download reached one million times. Firefox4 released Tuesday marked as the symbol to end the year-long development. 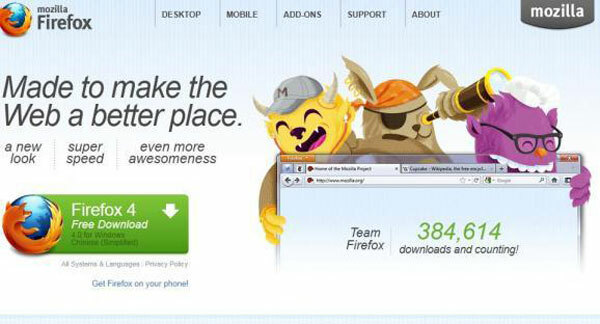 Mozilla released the first alpha version Firefox4 in February 2010. And in the original plan, Firefox4 would be released in November 2010 but because of a series of problems such as security vulnerabilities the development work was not completed until earlier this year. Firefox4 is the second browser with major upgraded features within this week. Microsoft released IE9 on March 14. There is a Panorama tag manager in Firefox4, with simple interface, supports graphics processor accelerating technology. Hardware acceleration has become a controversial point between Mozilla and Microsoft. Microsoft declares that IE9 is the only browser that realizes hardware acceleration by making good use of GPU processing ability. And the Mozilla denounces its opponent’s giving up of Windows XP. IE9 only supports Windows Vista and Windows 7. Microsoft defends itself in an email that the developer community has been calling for the progressive development of Internet. And the browser’s performance is closely related to its operating system. Running the latest browser in an operating system which is with ten-year history will make the Internet stay in the past. However, some Mozilla developers indicate that Microsoft’s statement which declares it has made good use of GPU processing ability is out of the reality. Firefox4 supports Windows, Mac OS X and Linux.